Florida was the battleground of the US elections. With an even mix of Democrats and Republicans, Florida is often referred to as a purple state. Many Americans believed that Florida could drastically influence the election outcome. But how did Twitter users feel about Florida on election night? 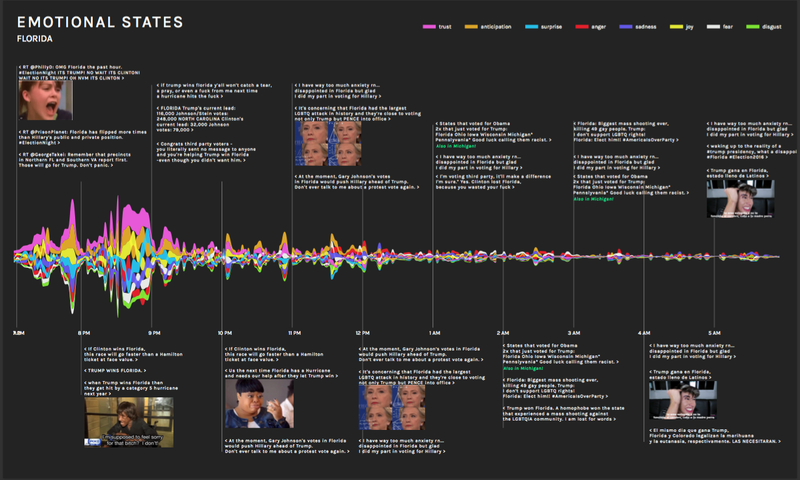 Did these emotions change towards the end of the election night? Data analysis allows you to go back in time. To be precise: Twitter. November 8th 2016. Social media like Twitter contain valuable information about emotions, sentiments and moods from large groups. Using Twitter, it’s possible to analyse thousands of tweets and even more. For this article, we’ve analyzed how people tweet about Florida, and what are the most retweeted tweets containing the word Florida during American election night. Using an automatic emotion analysis programme, we are mapping the emotions about the state of Florida during election night. The Americans voted for a new president. One who’s been inaugurated today as president Donald Trump, of the United States. His road to presidency has been paved with rumours, noise and emotional outbursts from both supporters and opponents. During election night, we found that most anxiety concentrating on states in the United States is on Florida. At least when we look at Twitter. Twitter messages about Florida were very emotional, anxious and angry. Let’s take a look at the emotional timespan during the night on Twitter. From 7 pm, there’s lots of suspense and tension: what is going to happen in Florida? And how will it influence the overall result? Hillary Clinton and Donald Trump are running head-to-head. In the graphics we see a high amount of anticipation, calculated by the emotion analysis programme. After 8 pm, the graphics show a high amount of mixed emotions. Anger, joy, fear, anticipation. Everything is possible: the results aren’t in yet. What’s it going to be? Twitter users are somewhere between hope and anxiety, whatever their political preference. But also, a harsh message is often retweeted: If Trump wins, then Florida won’t be protected from any natural disasters. When Florida has been called for Trump around 9 pm, Florida is blamed by many Twitter users. Now Florida is in hands of the Republicans, the chances of Hillary winning were drastically reduced. Whether all hope for Hillary Clinton has been lost, depends on different states now like Michigan and Pennsylvania. But we see that the red (anger) and white (fear) curve are still quite resonant during the night. Trump won Florida. A homophobe won the state that experienced a mass shooting against the LGBTQIA community. I am lost for words. The example of Florida shows that automatic emotion analysis over Twitter is a fast and effective way to monitor a large quantity of public feeling towards a political subject, in this case the sentiments towards Florida on election night. Tweets are written at the speed of thought. Using twitter analysis, we can analyze these outbursts of the mind in real time. Emotions are usually intense during and after a particular event and tend to attenuate with the passing of time. Despite the many possibilities of automatic emotion analysis, we should not blindly trust its outcome. Keep in mind that emotion-analysis tools have their weaknesses. In the case of Florida, ‘trust’ is connected to tweets with the word “winning”, such as: “Trump has won Florida”. In fact, these tweets were factual and objective. Another important thing to remember is that such an analysis does not necessarily represent the public opinion. The tweets aren’t only from Twitter users in the United States. Also, research shows that about 20-25 percent of the US population has a Twitter account. Therefore one must be careful not to make hasty conclusions regarding the actual facts.